Public interest in the handling of fraud and crime that prevailed under the Rajapaksa Regime shows a new interest with the action by the Permanent High Court Trial-at-Bar over two key figures in the past regime. Gotabhaya Rajapaksa, brother of Mahinda Rajapaksa and former Defence Secretary, and six others, were noticed to appear before the new court with regard to misappropriation of funds over construction of the D. A. Rajapaksa Museum and Memorial. This followed the High Court also issuing notice on Gamini Sedera Senarath, Chief of Staff of President Mahinda Rajapaksa, and three others, on misuse of public funds under the Public Property Act, Penal Code and Prevention of Money Laundering Act. These cases mark a major change in what was seen as a long delay in the fight against corruption by of the former regime, which was a major pledge of the in the political campaign to defeat the re-election of President Mahinda Rajapaksa in January 2015. There was major public concern about investigation and legal action delays on matters of corruption by those in the Rajapaksa Regime. This led to criticism by President Maithripala Sirisena over attempts to cover up some of these probes, and led to ministerial changes in the UNP branch of the ruling coalition. Through the past three years, Gotabhaya Rajapaksa was seen as one above the law, who could not be brought before the courts, with fundamental rights petitions to prevent his arrest, and several justices recusing themselves from cases involving him, on matters of major corruption. There has been a perception the government has understandings with the Rajapaksa family in not moving strongly against its members associated with crime and corruption, or delaying and straining in action against those identified as involved in corruption. The related delays in legal action against Gamini Senarath led to resignation of former Minister of Justice Wijeyadasa Rajapakshe from the Cabinet. The close association of Gotabhaya Rajapaksa with former high-ranking services personnel and his moves to contest the next presidential election also led to considerable suspicions of delayed or ineffective legal action against him. The notice on Gotabhaya Rajapaksa and six others is over the misuse of Rs. 90 million of state funds to build the D. A. Museum and Memorial in Medamulana, a memorial to his father, and of the other Rajapaksa siblings in politics, who held power in the last regime. The allegations involve the misuse of such funds with no oral or written contracts with the Land Reclamation and Development Corporation and the DA Rajapaksa Foundation for this construction, and use of resources of the Sri Lanka Navy for this work. The notices against Gamini Sedara Senarath, and three others, are on high-profile financial fraud and corruption, relating to investing Rs. 500 million of public funds at Helanco Hotels and Spa, which funds had been originally given by Litro Gas Company to Canwill Holdings Ltd. This is an inquiry involving public funds of Litro Gas, EPF and other public institutions, over which Gamini Senarath the former Chief of Staff of President Mahinda Rajapaksa had much control. The High Court Trial-at-Bar notices point to more activated moves to deal with fraud and corruption during the Rajapaksa Regime, grossly delayed, with suspicions of alleged dealings among corrupt forces across the past and present governments. These notices, with more to follow in this court, and two more such High Courts to be set up, point to the fight against the Rajapaksa corruption moving to stronger action as the Presidential and General Elections approach. 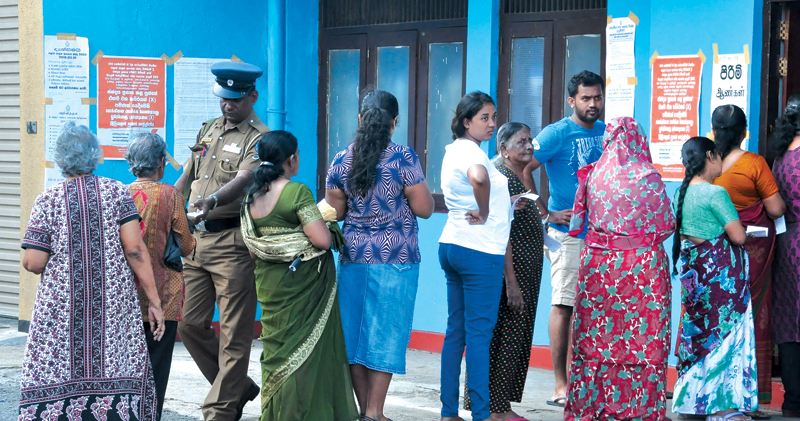 Sri Lanka’s record of an electoral democracy for more than 70 years, is taking more than a small punch with the delays in the Provincial Council polls. The decision of parliament to overwhelmingly reject the Delimitation Committee Report on the Provincial Councils, throws a major spanner in the works of the democratic process. The public expectation of timely elections to the Provincial Councils – three already awaiting polls, and more to follow soon – point to a major political disagreement on the electoral process, that seeks to combine Proportional Representation (PR) with that of First-Past-the-Post (FPP). The rejection of the Delimitation Commission Report (DCR) by all parties, other than the JVP that was absent at voting, show a wide disagreement with the new trends in elections seen in the February 10, Local Government polls. The parties of the minorities fear the reduction of their membership in the Provincial Councils with FPP. There are major disagreements on how members are to be selected to the PCs, as seen in several local authorities. Questions are raised on formulating female representation in the PCs, seeing the problems after the LG polls. There are strong moves to revert to the PR system, seen as politically advantageous, especially to the minorities, with little consideration to the failure of PR to have a direct link with the voter, and the overall corruption it entails. The lack of direct links with voters causes increasing youth to be uninterested in elections, with the increased influence of social media on patterns of polling. A Committee headed by the Prime Minister will study the best amendments to the DCR, hopefully to hold the next PC polls by January 2019. With the delays already seen in tabling the debating the DCR, the promise of a January 2019 PC poll is most unlikely. The delay in these polls has the danger of moving to a clash with the coming Presidential Poll –after January 2019, and the next General Election in 2020. As the PC polls are delayed there is the rise of the politics, especially vi-a-vis the Presidential Election. With the President entitled to call for the next presidential poll any time after January 2019, it will be a major challenge to have the next PC polls before the presidential poll. The major political parties in government may see this as an advantage, with the experience of the resounding defeat both faced in the February Local Government Poll. However, the Joint Opposition (JO) also opposing the DCR shows that they too are not eager for early PC polls, although their sloganeering is one calling for early polls. The JO is entrapped in the choice of its presidential candidate. The legal arguments by those seeking a third term for Mahinda Rajapaksa, with constitutional issues on the absence of reciprocity in the 19th Amendment to the Constitution, show a clear disagreement on the next presidential candidate. One fact that the JO will have to face in this situation is the candidature of Maithripala Sirisena, leading the SLFP- the Blue Party. The JO may soon be compelled to face this reality and seem political understandings among the Blues and Purples, if they are keen on keeping out the UNP. The silence of the UNP on the constitutionality of a new Rajapaksa Third term is a sign of the new developments, emerging from delayed PC polls and the rivalries between the Blues and Purples. While the delay in PC polls will have a negative impact on the democratic process, there is much cause about the realities of Provincial Council costs and payments for Municipal Councillors. The Western Province Governor has apparently failed in the bid to prevent the Western Provincial Council from having chairs costing Rs. 640,000 each for the councillors. The public outcry against this gross waste of funds, in a province with considerable poverty, has been wholly ignored. The Provincial Councillors will have revolving comfort on their buttocks, with complete disregard to public opinion, and the actual needs of provincial expenditure, pointing to a democracy of distortion. We now have another display of this search for ‘people’s representatives’ – elected at recent polls, to benefit themselves with the funds of the people. It is gross increase of allowances to members of the Colombo Municipal Council, in total disregard of the need for economy in the management of a local authority, which may have profited from the huge rates and taxes imposed. This near doubling of allowances for Colombo Councillors, (opposed by the JO members), comes soon after Members of Parliament were compelled to stop moves to raise their allowances. A contemptuous dealing with the need for good accountability and service to the community that elected the councillors. From luxury chairs for Western Provincial Councillors to raised allowances, plus phone and other regular costs, to Colombo Municipal Councillors, this is scornful disregard of the service necessities of those elected to serve the community. This points to the need to re-think our electoral process, bringing better and closer contact with voters, the tradition under which the best Councils were built over the years. Mayors, Chairmen, and members of the old councils had commitments to service. Can we achieve electoral reforms to restore this tradition of service?